How to make a difference in tailoring business store? With today’s ever-changing business landscape and cut-throat competition, looking sharp & unique has become a part of every business website. Now, tailoring business is judged not only on the quality of work but also on your appearance of the tailoring business website. As far as world wide obsessions go, tailoring & fashion is probably the top. Yes, we need clothes for practical reasons, but tailoring and fashion industry grows beyond that. Globally, most of the people who are in clothing & tailoring industry have entered into the digital world. In this digital world, our websites speak more about us. Quality of the work becomes a secondary option. So if business people and tailors have an idea to start their tailoring business store in online, then look at the following key points to get a clear idea in creating your online tailoring business store. Tailors and store owners should have a complete freedom to customize their tailoring business website according to their own creativity. They should have an audience tracking facility, various payment gateway systems etc.. Choose a highly performant system what gives you total control of your services, branding and more. When it comes to the design, choose the website design to attract the end user in few seconds. Create a fully customized, responsive online tailoring business store that speaks about your brand. E-commerce solutions are the easy, fast, elegant way to sell your products. Provide a complete e-commerce website to do online tailoring business with current technical features like augmented reality to grab the attention of the userend for satisfying business requirements. A question arises in everyone's mind that "Is above key points are enough to make a difference in the online tailoring store?" We cannot say the above features are only enough for starting a unique online tailoring business store. These are the basic key points to be followed for creating a unique online tailoring business store. 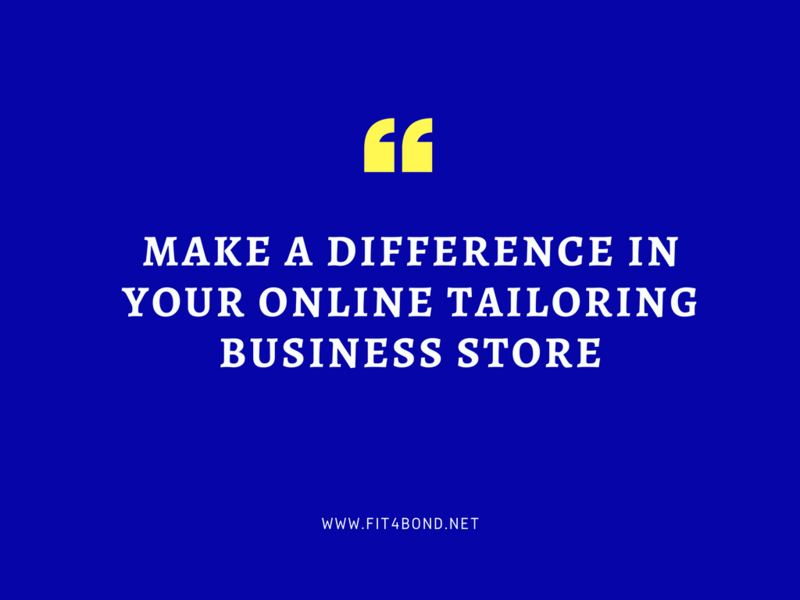 Fit4bond have created an online tailoring platform for tailors and business people to erect their online tailoring business store in an cost-effective manner with advanced features. online tailoring software, online tailoring script, online tailoring platform, online tailoring business, online tailoring store software,online tailoring store script, custom tailoring store script, best online tailoring software, complete ecommerce solution for tailors.